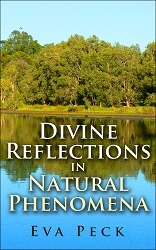 Divine Reflections in Natural Phenomena is a Christian book which explores how spiritual realities can be glimpsed in the world of nature. Has the voice of creation – life and its order, beauty and harmony, the marvels of nature – spoken to your heart? Why not carve a little time out of your daily routine to take a deeper look at life’s mysteries all around. Listen and ponder your insights. Your life may never be the same. For a preview of the book and purchase information in paperback and hard cover, click on the image or here. Also available through Amazon (paperback and Kindle formats) and other outlets. See http://www.amazon.com/Eva-Peck/e/B00DH68WPE for its companion volumes and the author’s other books. 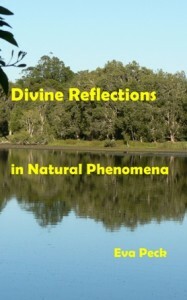 Australian readers may find a better value for Divine Reflections in Natural Phenomena at Fishpond. This online store sells discounted books and delivers them postage-free. Thank you kindly for your book series Divine Reflections. I have skimmed through the previews and think that the books are indeed wonderful. I think that your work and words will be an inspiration to the many people that need them in this difficult world in which we are living. You have the experi-ence, knowledge, ability and the spiritual background to reach out to people to give them hope. Well done! I have found your book educational, informative and at the same time easy to read. Each time I read one of your books, I am amazed at your knowledge. I have learned many interesting things and have also appreciated the spiritual side of the book. A book like this can be reread over and over. I found your book to be a blend of the cosmic Christ you have discovered in nature and the deep-rooted “word” which is imprinted in your heart. I really liked these reflections and feel like universal truths come through and the words spoken are honest. Feel free to add a comment or a review on Amazon, Goodreads, or Free e-books.